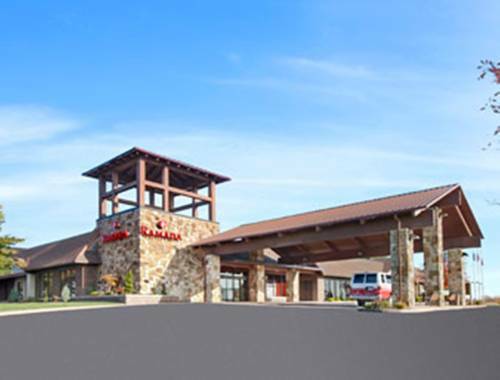 Ideally located in the foothills of the Laurel Highlands, this Ramada Greensburg Hotel and Conference Center is minutes from St. Vincent College, Seton Hill University, the University of Pittsburgh at Greensburg, Latrobe Regional Airport, thrills at Idlewild and SoakZone amusement park, and skiing at Seven Springs Ski Resort. Relax at this hotel with complimentary wireless Internet access, free hot breakfast, heated indoor pool, fitness center, dry cleaning services, airport shuttle services, full conference facilities and business center. Unwind at the Prospect Lounge onsite with live entertainment, and enjoy a delicious meal at the onsite restaurant, Vista Plateau Restaurant, for breakfast, lunch and dinner. Guest room amenities include pillow top bedding, desk, ergonomic chair and flat-screen TV. Hot tub suites and handicapped-accessible rooms are also available. Pets are welcome at this smoke-free lodging. There is no charge for children 17 and under with an adult.